"As in virtually every other pumpkin dessert, I think using pure canned pumpkin will give you the best results--it has more concentrated flavor than freshly roasted pumpkin. These light, not-too-sweet Italian doughnuts were adapted from a recipe by my old friend, Jennifer Perillo. I usually toss these in cinnamon sugar when they're still slightly warm." Try Chef John's light and airy, pumpkin-flavored Italian doughnuts. Absolutely delicious and so easy. Everyone loved them and will definitely make again. Thank you for a great recipe. These were amazing! 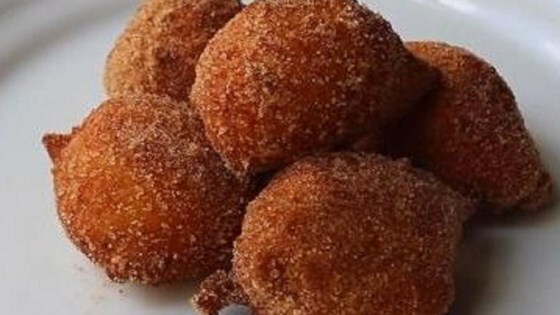 Similar to donut holes, but with a moist center.